Fifty-seven teen-age boys were burned to death early Monday when Kenya's deadliest fire in recent times engulfed their boarding school dormitory, and police said they suspected arson. Many survivors suspected disgruntled students set the fire. Some students had been angered in recent weeks by the headmaster's demand for unpaid fees and the education ministry's decision to throw out final exams because of cheating. "We have a strong suspicion of arson," police spokesman Peter Kimanthi said outside the charred walls of a dormitory at Kyanguli Secondary School near Machakos, a farming town 50 kilometers (30 miles) southeast of the Kenyan capital, Nairobi. Kimanthi said 130 boys between the ages of 15 and 19 had been sleeping in the building. A padlock on one of the two doors and iron bars on the windows prevented escape through those routes, officials and students said. Survivor Mutisya Kauma, aged 16, said he could not sleep in the early part of the night and got up to go to the toilet. "I saw the dorm was full of some liquid but I dismissed it as rainwater," he said. "When I came back a voice asked 'What is that smell?'. I then thought the liquid was petrol. A few minutes later, I heard a loud bang and I saw somebody wearing a sports jacket running away. After that -- fire." Survivor Michak Mutuku, 18, said he believed the fire was set by students who had called for a strike in a dispute between students and administrators. Notes circulated at the school Friday calling for a strike to demand that the headmaster step down, but few students went along with the walkout. "I think it's because we went to classes, because what they wanted was disobeyed," Mutuku said from his bed at Machakos General Hospital. President Daniel arap Moi, a former primary school teacher, emerged visibly shaken from the ruined dormitory. Several piles of bodies could be seen inside the building. "This is a ghastly incident that has never been seen in these parts before. The doors should have been open. These children could have escaped easily," he said. Kimanthi said officials at the boys school smelled gasoline in the dormitory on Sunday, checked it but found nothing. Mackenzie Waema, 19, a student who was sleeping in a second dormitory about 100 yards away, said gasoline had been spread throughout the other building, and it was burning in the center of the dormitory when he was awoken by screams and pounding noises. Waema said student-teacher hostility could be a possible motive. "There was a misunderstanding between the administration and the students. They (the students) had grudges," he said. "That could have brought this calamity," he said. At Kenyatta National Hospital in Nairobi, the father of one injured student said his son had told him of plans for a student protest against conditions in school. "I don't kno if this is the reason why they were burned. Boys who survived said some of their colleagues went to the dormitory with petrol in small jerrycans," said Peter Wanyoro, father of Jacob Wanyoro, 16, who suffered 90 percent burns. Police struggled to keep a crowd of several thousand away from the dormitory, built of blocks of volcanic material. The corrugated iron roof, which had been supported by wooden thrusts, collapsed shortly after the fire broke out. Looking through the building's 10 barred windows, reporters counted 48 bunk beds in a building that measures approximately 130 feet by 50 feet. No school officials were available to comment how 96 beds could accommodate 130 boys. Waema said one of the dormitory's two doors was always kept open; the other was padlocked. Those who managed to escape the fire did so through the open door. The flames in the middle of the building prevented those at the other end where the door was locked from getting to the open door. Provincial police commanding officer Wellington Choka said the fire brigade had not been summoned when the fire was reported, and police using the school's garden hoses as well as heavy rain eventually put out the fire. Most of Kenya's secondary school students attend boarding schools, either government-run or private. Disputes over mishandling of school funds, lack of facilities and quality of food and accommodation are common. 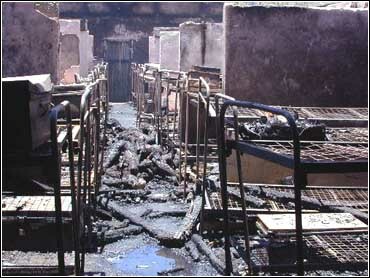 In March 1998, more than 20 girls burned to death in a secondary school fire near Kenya's Indian Ocean port of Mombasa. They had been locked inside the school by the management. On March 5, a fire caused by an overturned kerosene lantern killed 23 girls sleeping in the locked dormitory of a school in northern Nigeria.